These are the projects that I completed, yesterday. 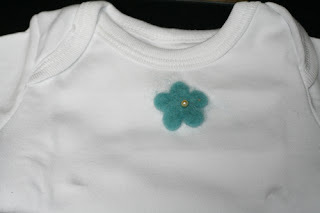 The first little onesie has a pea pod on it (I hope you could tell that's what it was!). 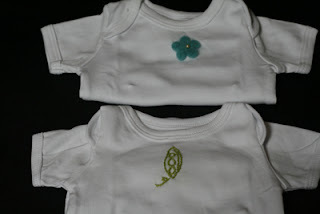 I love baby stuff with pea pods on it, it's so sweet! The second one was made from a scrapbooking embellishment that I just sewed on - it's a little felt flower with a pearl in the middle. So, so sweet! I think I am going to make some for Holland too. She asked me, "Mommy, can you make me one with three flowers because I'm three?" "Of course I can, sweet pea!" Very sweet and cute ! 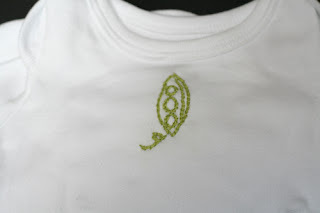 So glad you are starting to embrodiery. You can pass alot of hours doing that! Lol Mom Aunt Chris would be so proud of you! !